The rising prevalence of mental illness is a growing concern for societies worldwide and access to mental health care is one of the top public health priorities in Scotland, as in many countries. In addition, as more and more people migrate and settle or take refuge in countries with a dominant language other than their own, the need for interpreting/cultural mediation in mental health care settings is also on the increase. The research project on Access to Mental Health Care for Linguistically and Culturally Diverse Patients, supported by the Scottish Universities Insight Institute (SUII), is led by the Centre for Translation & Interpreting Studies in Scotland (CTISS), based at Heriot-Watt University, in collaboration with the University of Strathclyde, home to the Centre for Health Policy; the Psychiatric Care Unit, at St John’s Hospital, Livingston; and the Mental Welfare Commission for Scotland. The aim of the project is to bring together mental health practitioners, interpreters, health care administrators, policy makers and academics to discuss the most salient care provision issues with the goal of understanding systemic difficulties and enhancing access to services. A one-day research seminar will take place on Thursday 9 April at the SUII premises in Glasgow. A multidisciplinary group of international experts from Australia, Canada, China, South Africa, Sweden, the Netherlands, the UK and the US will discuss and scope, from their respective viewpoints, current issues faced in the provision of mental health care to linguistically and culturally diverse patients. The same group of international experts will contribute to a linked open seminar with the wider stakeholder community to be held on the morning of Friday 10 April at the Riccarton campus of Heriot-Watt University, in Edinburgh. This seminar aims to extend the discussion from research to application by creating an opportunity to share experiences and examples of good practice from around the world. For practical information and to register for either or both events, please visit the project webpage. For further details please contact Professor Isabelle Perez, Languages & Intercultural Studies (LINCS). Translation and Interpreting Studies (John Benjamins) invites proposals for a special thematic issue on signed language interpretation and translation to be published in April of 2018. The editors aim to bring together papers that address critical issues in the linguistic analysis of interpretations and translations that occur between a signed language and spoken or written language. We welcome data driven papers on the spectrum between a microanalysis of one specific lexical item to the examination of a full interpreted or translated discourse. Papers may take a descriptive, applied, or theoretical approach to interpreting and translation of a signed language. We encourage a broad range of methodological approaches and theoretical frameworks, including qualitative, quantitative, and mixed methods. Abstracts should be sent to both guest editors. If you have any questions, please contact Laurie Swabey (laswabey@stkate.edu) and Brenda Nicodemus (brenda.nicodemus@gallaudet.edu). Last Wednesday, 11th March, Nicola Bermingham held a seminar at the School of Celtic and Scottish Studies at the University of Edinburgh. The seminar, entitled “I can write it, I can understand it, but I’ve never spoken it”: challenges faced by immigrant “new speakers” in Galicia, formed part of the Soillse seminar series which focuses on minority language policy and sociolinguistics. The seminar explored issues around ‘new speakerness’ in the context of migration, taking Galicia as the primary research site. Traditionally, Galicia has experienced lower levels of immigration than the rest of Spain. However, the first decade of the 21st century saw an increase in the arrival of immigrants. This was due in part to increased work opportunities in the primary sector as well as the ‘saturation’ of other autonomous communities such as Catalonia. Hence, Galicia, which was once a region synonymous with emigration, has now become host to a diverse migrant population. The seminar focused specifically on Nicola’s ongoing PhD research, which examines the role of language in the integration of a community of Cape Verdean immigrants living in a small fishing town in northern Galicia. Interestingly, the hierarchical relationship between Portuguese and Creole in Cape Verde shares many similarities with that of Spanish and Galician in Galicia. Drawing on excerpts from life history interviews carried out with various members of the community, the seminar provided a platform to tease out discourse on language ownership and language as a means of integration into a host community. Following the presentation, thought-provoking discussions took place surrounding the challenges and opportunities faced by Cape Verdean migrants in becoming a “new speaker” of Galician and Spanish. Nicola Bermingham is a PhD student in the Department of Languages and Intercultural Studies at Heriot-Watt University. Her research interests include sociolinguistics, migration studies, and minority languages. Looking specifically at the Galician context, her work examines the role language has to play in the integration of immigrants. 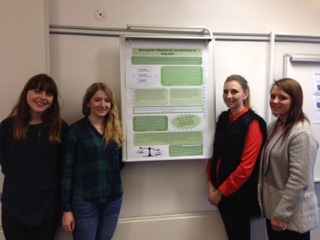 A 2nd Year General Linguistics Poster Session took place on 18th and 19th February in LINCS. This was the first poster session for 2nd year General Linguistics students and the results were impressive, to say the least. This was part of the students’ assessment and the topics were chosen based on their General Linguistics lectures, but the event also worked towards bridging the gap between undergraduate and postgraduate research. The posters addressed topics from a wide variety of geographical terrains, from Scots, Gaelic, and British Sign Language here in Scotland to language policy in Germany, France, Belgium, and Portugal. The students employed a range of methodological approaches, including qualitative interviews, surveys, questionnaires, and conversation analysis of audio-visually recorded data. They were also encouraged to produce original research while showing an understanding of existing literature and key theoretical concepts. The event was widely publicised and both members of staff and postgraduate research students from LINCS attended. This meant that students experienced the process of a poster session at a real academic conference, since they also presented their posters to the assessors and other staff in LINCS and then fielded questions about their research. The result? Not just nice food and networking. Many of the students expressed a keen interest in further developing their topics and pursuing more advanced sociolinguistic research. A selection of posters is now on display outside the interpreting labs in Henry Prais building. Special thanks to PhD students Nicola Bermingham and Sara Brennan from LINCS for organising a most successful poster session! Intensive Interpreting Practice – Easter Course 2015 ! In April this year Heriot-Watt University will be running an Intensive Interpreting Practice CPD course. Interpreting students who are in the middle of their training and wish to improve both their English skills and their Interpreting skills. Professional interpreters who would like to improve their English, either with the intention of making it a B language or simply to complete an intensive professional practice course. This is a non-language specific course so all language combinations are welcome! We mainly work with audio-visual material (but not only!) and everyone will have the opportunity to practise intensively and to network with professionals in the industry.